On Tuesday, the All Party Parliamentary Group for Egypt hosted a discussion in Parliament between a non-official group of Egyptian representatives and representatives of Human Rights Watch. The meeting was hosted by the co-chairs of the APPG, The Rt. Hon. Stephen Timms MP and Mr Jonathan Lord MP. Lord Stone of Blackheath, Lord Marlseford DL and Mr Samir Takla, the group’s advisor, were also in attendance. The Egyptian group consisted of Dr Mahmoud Karem of the Egyptian National Council for Human Rights; Dr Maya Morsi, President of the Egyptian National Council for Women; Mrs. Dalia Youssef MP, chair of the Egyptian-British Parliamentary Group; Judge Ms. Marwa Barakat; and Dr Heba Hagrass MP, member of the Egyptian Parliament’s Social Solidarity, Family, and Persons with Disabilities Committee. Human Rights Watch was represented by North Africa and Middle East officer Amr Magdi, senior legal advisor Clive Baldwin, women’s rights officer Rothna Begum and advocacy and communications officer Myrto Tilianaki. The discussion entailed a constructive exchange of views, and ideas for future co-operation. Earlier this week, MPs debated the government's handling of the so-called "Toeic students". The estimated 7,000 students had their visas cancelled after a BBC Panorama investigation in 2014 uncovered evidence of widespread cheating at testing centres delivering the Test of English for International Communication (TOEIC). During the debate, Wes Streeting, MP for Ilford North, cited figures obtained by the House of Commons Library, which said that by the end of September 2016 more than 35,870 visa holders had had their visa refused or curtailed on the basis of the TOEIC scandal, and more than 4,600 had been removed from the country. Wes went on to called the case “Britain’s forgotten immigration scandal,” referencing the recent Windrush scandal, and said the Home Office had placed students outside the normal immigration processes by denying them the right to appeal. He insisted that an apology and full compensation be given to students, and said an independent inquiry into the case is necessary. Other MPs echoed his calls. Both lawyers representing the students, Patrick Lewis QC and Sonali Naik QC of Garden Chambers, expressed their disappointment at the minister’s response. Speaking afterwards to Professionals in International Education News, Patrick said "...I just don’t understand the minister’s response… there should be acknowledgement that ETS can make mistakes and [the government] can’t simply rely on the accusations that they make.” Sonali also criticised the minister’s use of the word "proportionate" and said that the push for out-of-country appeals does remedy the situation. "It’s not proportionate to treat everybody in the same way when you know your evidence may well be flawed,” she said. Speaking afterwards, Stephen said "It was very important that MPs had the chance to debate this issue in the House of Commons. The MPs who took part made clear just how much hardship has been inflicted – unfairly – on a very large number of students. “The Minister’s reply to the debate suggests that the Home Office still hasn’t grasped the scale of the problem, or recognised the hardship they have caused to so many students. Thousands have done nothing wrong, but been robbed of their futures by the actions of the British Government. Stephen joined people with arthritis at an event in Parliament last week to hear about life with the condition and learn how aids and adaptions in the home can help people live independently. Arthritis and related conditions are the number one cause of pain and disability in the UK, affecting 17.8 million people across the country. Speaking afterwards, Stephen said: “4,087 of people in East Ham are living with osteoarthritis of the hip, 6,768 with osteoarthritis of the knee and 20,251 with back pain, so I wanted to show my support for them in Parliament and hear from people with arthritis about the help that makes a difference to their lives. Yesterday, Plashet School competed in the final of the Solutions for the Planet’s Big Ideas Competition in the Houses of Parliament. Solutions for the Planet is a social enterprise which works with businesses, schools and communities to promote education for sustainable development, social enterprise, and science, technology, engineering and maths (STEM) careers for young people. The team presented their big idea of ‘Rent-a-bike’ to a panel of judges having fought off over 3,000 other teams across the country to make it to the Final. The idea involved the upcycling and renovation of old bicycles and then renting them out for day hire .The group said the idea would reduce waste and dependency on cars. A similar competition is expected to be run by Solutions for the Planet next year that will seek to once again produce creative ideas as students seek to sustainable improve our country. Stephen has attended a session of the successful money skills programme aimed at primary school children, KickStart Money, in the Houses of Parliament. The workshops are normally held in schools across the country, however this special session took place in Parliament to mark the launch of a report into the effectiveness of the programme. The independent evaluation found the initiative to be highly effective, with 70% of pupils consulted three months after delivery working towards a saving goal. The young people surveyed strongly agreed that “...how they think about and treat money now will make a difference to their future”. Teachers also reported that “...87% of their pupils now understand that their financial decisions have consequences”. The KickStart money programme is delivered by the charity MyBnk and is funded by a grouping of 20 leading financial services firms brought together by the Tax Incentivised Savings Association. The initiative is part of a mission to demonstrate to the Government the advantages of including financial education on the primary school curriculum. KickStart aims to help set up young people to be responsible savers in the future. It hopes to reach 18,000 children over 3 years thanks to a cross-industry collaborative £1 million investment. Research by the Money Advice Service has found that early intervention is key and that behavioural attitudes to money are formed by the age of seven. Only one third of parents talk to their children about money, and there is a significant lack of financial education provision in schools for children in the UK, particularly at the primary level. Today, Stephen watched a class of 9 – 11 year olds as they tackled everything from understanding the value of money, to the importance of delayed gratification and saving. The workshop will be coming to Stephen’s constituency next week. Last week, Stephen attended the Community Links Jobs Fair in East Ham. The event included exhibition stalls from several local employers such as Nando’s, Zzetta, Travel Lodge, Bupa and IBM. Other local organisations also attended, including the University of East London, Newham Workplace and West Ham United Foundation. The fair offered guests the unique opportunity to interview for jobs on the day. Attendees were also offered free interview clothing provided by Ben Sherman, and had the chance to browse stalls set up by small businesses and self-employed entrepreneurs. Further entertainment included face painting, games, a raffle, and free food provided by Nando’s and Zzetta Pizza. Speaking after the event, Stephen said “today’s Jobs Fair was a big success. In the current climate, it is vital that we help people into work and this is a great way to do just that”. “More and more employers are looking to recruit in Newham as London continues to move east, which is very encouraging!”. Earlier this week, Stephen hosted the graduation ceremony for this year’s cohort of ParliaMentors from the Faith and Belief Forum. The event was held in Parliament and included a keynote speech from Luciana Berger, MP for Liverpool Wavertree, about the importance of faith, cohesion and driving change at a local level. Graduates of the scheme were presented with certificates and thanked for their hard work and dedication across each of their social action projects. ParliaMentors is a UN award-winning leadership programme which offers university students of different faiths and non-religious beliefs the opportunity to work together to create real social change. Each team is sponsored by an MP and has access to Westminster, local and national NGOs, and expert training. This equips students with the necessary skills to make positive changes to their communities, their careers and the political arena. 45 students completed the programme this year, across 9 different universities. Stephen mentored a team of 5 from Queen Mary University. The team’s project, Faith2Faith, brought together faith and non-faith students to nurture a community allotment on the university campus. Speaking after the reception, Stephen said “I was delighted to host the graduation ceremony today. I very much enjoyed my visits to the community garden at Queen Mary University, and I wish the team all the very best in the future”. Stephen has uncovered the failure of government flagship scheme, Youth Obligation, to keep any records of their clients. Recent reports suggested that around 15,300 young people have dropped off the scheme without finding work, and without the organisation gathering any information about their whereabouts. Youth Obligation was set up in April 2017 to offer specialist help to 18 – 21 year-olds from Jobcentre advisors. It has replaced the government’s Work Programme and aims to help young people into employment by offering advice on how to succeed with applications and interviews. Following a report published by the MS Society, a charity which supports those with multiple sclerosis, the MP hosted the Westminster event to discuss the negative impact PIP has on those with MS.
MS is a neurological condition which affects the brain and spinal chord. It can cause spasms, cognitive problems and issues with balance. PIP is the replacement benefit for the Disability Living Allowance (DLA). Its rollout began in 2013, with the biggest change being the ‘20 metre rule’ – an assessment which states if you can walk more than 20 metres, you aren’t eligible for the highest rate of mobility support. Under the DLA, this limit was 50 metres. According to a survey in the MS Society’s report, 65 per cent of people with MS said the new rule had negatively impacted their illness. Under the old assessment, 94pc of people with MS were receiving the highest rate of mobility support – now it’s just 66pc. Genevieve Edwards, the society’s director of external affairs, said: “It’s causing enormous harm to people with MS, with many losing their independence as a result. This senseless and unfounded rule is leading to people with the highest need facing the biggest losses. Stephen has joined Lyn Brown, the Member of Parliament for West Ham, in opening a new MRI scanner at Newham University Hospital. 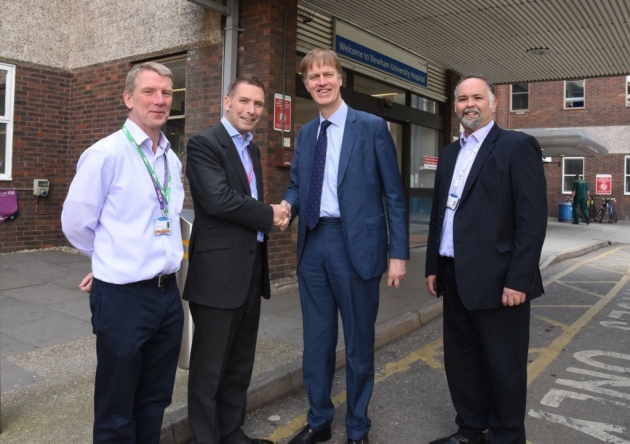 The pair cut the ribbon to officially unveil the state of the art device, which means that patients suspected of having prostate cancer can now be scanned on site, rather than being transferred to the City of London for treatment. Around 500 people are being treated with the scanner each month, said the hospital’s clinical director of imaging, Dr Hussein Kamel. The technology will reduce patient waiting times and allow for more accurate diagnoses, according to Barts Health NHS Trust, who run the hospital.